Rupesh Kumar Chattaraj is suffering from Cerebral Palsy with 100% disability. His parents are trying hard to find a cure and treat their child so that, he can lead a normal healthy life. During his regular check-up last year, it was revealed that his seizure attacks has relapsed in the form of horrifying attacks known as Gelastic seizure. He gets more than 150 such attacks a day. A Hospital in Kerala has a 100% success rate in curing children with similar disorders. Rupesh is yet to start with this treatment known as Electro Homeopathy in this hospital. We are raising funds to support his treatment in this hospital in Kerala, India. My son, Rupesh, is 06 years old and has been diagnosed with Cerebral Palsy (with 100% disability). I am a professional, and my family and I hail from West Bengal, but are currently stationed in Bangalore, where I work in a private ltd company. Cerebral Palsy is a disorder of the brain. Due to oxygen deprivation, the brain cells gets damaged to a large extent during birth. This causes blindness, delayed miles stones and without the available treatment the patient becomes mentally retarded for the rest of his/her life. If Rupesh is left untreated then chances of his any further development will become completely impossible. When Rupesh did not attain head holding at the age of 09th months, we visited a Pediatric Neurologist in Asansol, West Bengal. On further investigations and lab tests, we got to know that he has an impaired vision, not able to listen and doctors at that time were not able to say how far he will develop on his reflexes. But now, there is a treatment available for kids like our son Rupesh and several such kids are leading a complete normal life. They are admitted in normal school, they have grown very intelligent and are making their parents feel as proud as they could have ever have wished. I belong to an extremely humble background – my family members do not work and I am the only earning person in the family. I work in a private limited company and work on a paltry salary where I also have the responsibility of my ailing parents. My wife is a homemaker. We cannot afford the cost of the medical expenses and costs that are related with his treatment. We now turn to you for your support in treating our beloved son. We have sold our property and all other assets to fund his medical expenses so far, which has cost us around Rs. 18 lakhs. We are facing financial hardships in providing for the rest of the expenses. 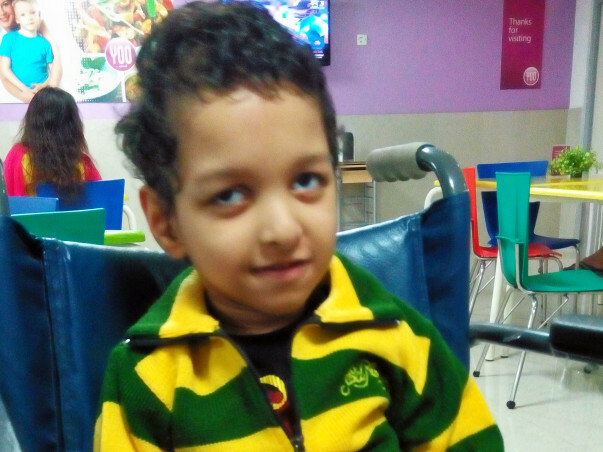 We urge you to contribute anything within your means to help treat Rupesh. 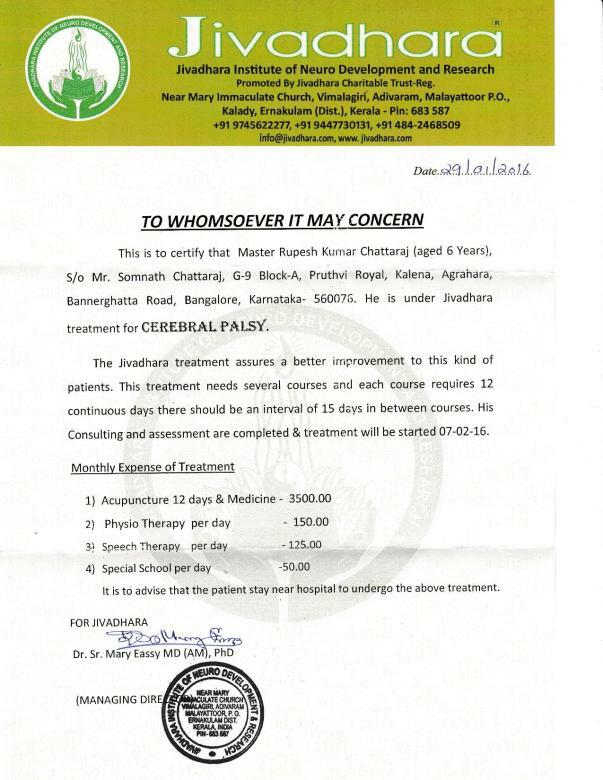 There is a treatment available for kids who are battling Cerebral Palsy in a Hospital in Kerala, India. It has attained 100 % success in treating kids who have similar disabilities like our child. The funds raised through this site will be utilized for the treatment and development of our son Rupesh. Presently we are in need of Rs.12lakhs and we have to arrange it fast. Rupesh has to stay near to the hospital with his mom and one more attandant from the family for the next two years. The treatment involves Accupuncture and medicine that will be administered for 12 days continiously along with Physiotherapy, Speech Therapy and Special school that will continue for 26 days in a month. The accomodation is available for a rent of Rs. 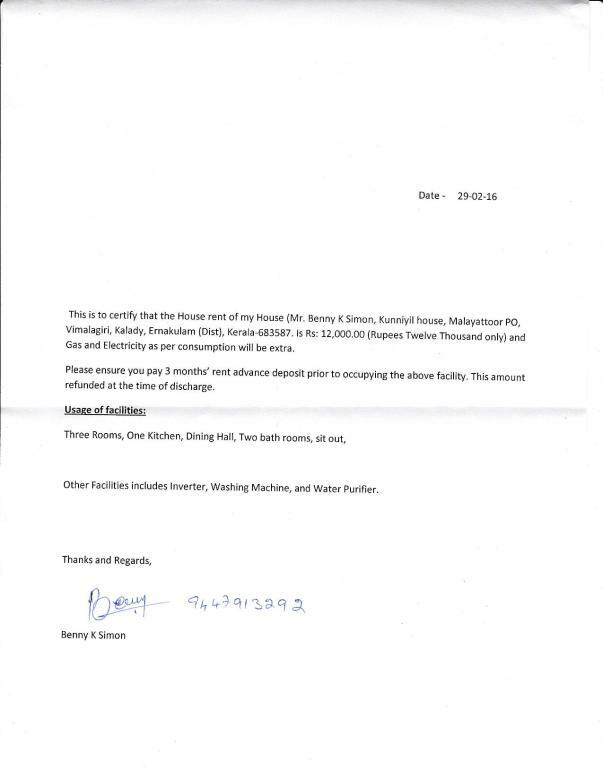 12000 per month and they would need us to deposit three months rent in advance before moving in. We need to continue this treatment for two years and one year's expense would be Rs. 7, 19, 400.